NIMCET 2017 Counselling- निट एमसीए कॉमन एंट्रेंस टेस्ट काउंसलिंग: NIMCET Exam 2017 was conducted few days back and thus after the declaration of results, eligible candidates must appear for NIMCET Counselling which is going to be conducted from 9th June 2017. 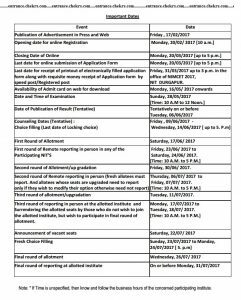 Through the NIMCET Counselling Procedure 2017, applicants will be allotted admission into the MCA programme offered by the various NIT Institutions of India. The counselling will be held in three rounds and therefore all the eligible candidates on the basis of their rank in the exam will be called for NIMCET Seat Allotment process. In terms of more details of NIMCET Counselling Schedule, fee, admission etc go through the details mentioned below. All the eligible candidates who are appearing for NIMET MCA Counselling 2017 must go through a number of subsequent rounds such as registration, choice filling, fee payment, document verification etc. Candidates on the basis of NIMCET Merit List will be called for the admission process. Candidates must submit an amount of Rs. 10,000 as an initial fee through SBI Challan before reporting to any of the participating NITs. To have more precise idea about the counselling session, below you can check details of NIMCET Counselling Dates. The NIMCET Counselling Procedure includes a number of rounds which is discussed below. To appear for the counselling applicants need to register themselves online and fill the required details as specified. All the eligible candidates will be allotted their respective seat on the basis of their marks secured in the exam. 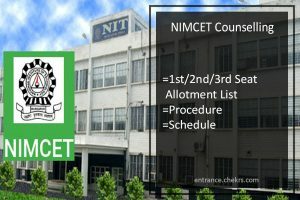 Therefore applicants will undergo through NIMCET Seat Distribution process where they will provided seats in three rounds upon choice, availability and merit. Incase of seat availability applicants are provided admission on the basis of NIMCET Spot Round. Candidates are allotted seat in any rounds of seat allotment but they don’t want to join that allotted Institution and wishes to participate in other round can report to the centre and surrender the seats by submitting a prescribed application. Those candidates who have surrendered their seats and have not allotted any seats in other rounds of seat allotment will be eligible for NIMCET Final Round which will be held in the 23rd July 2017. After the allotment of seats, candidates must report to the allotted institution within a prescribed date. After the counselling schedule authority will release NIMCET Counselling Result, where candidates will be allocated their seat on the basis of merit, choice and availability. The authority will release the seat allotment result through the website, we will also update you here with the same.